Biking is fun especially if you have the right bike for the terrain you are covering. A while back, I took my old bike for a ride on a rocky trail thinking that it is my skill set that is needed and that the bike does not matter as long as it is in good condition. Need I say I was very wrong? The bike is everything. The Raleigh Tokul 3 Mountain Bike will reduce the amount of energy you use to navigate the trail. It will also reduce your aches to a minimum and overall you will enjoy yourself. This is the skeleton of the bike and it holds all the other parts in place. There are different materials that make up the frame such as steel, aluminum, carbon fiber and titanium. When choosing a bike ensure that the frame is of the right height for you. The right height will ensure you have a comfortable ride since you are able to reach the pedals easily. The material is also important. The Raleigh is made of an aluminum frame which is a light material enhancing the better manageability of the cheap mountain bike. This is what you use to navigate your bike. The handlebar holds the headlight, brake levers and derailleur shifters. It is usually wider than the rider’s shoulders though some prefer it short therefore, they can replace it to their liking. The wider handlebar gives more control while steering the bike and also afford more comfort to the rider. The Raleigh Tokul 3 Mountain Bike has a fork measuring 27.5 inches with a 120mm travel. This feature aids in smoothing the bumps so that you have an easy time riding, even on rocks. Lockout minimizes the energy used when riding on smooth surfaces or uphill on a smooth dirt surface. The fork hosts a stanchion tube with a diameter of 32mm which absorbs the greater shocks generated by the rough terrain. Rebound is another part of the fork which controls the rate at which the fork re-extends after a compression in order to maintain the balance and avoid fast bounce back. Less fatigue for the rider since the lockout helps to minimize the amount of energy used. One is also able to ride in all weather conditions since the bike is able to handle the bumps and terrain. A less bumpy ride due to the ability of the shock absorber to handle the bounce back effect. The bike is fitted with Tektro Auriga hydraulic disk brakes which offer great stopping abilities. This allows the rider to use less force when applying the brakes therefore reducing the energy used, leading to less fatigue. These brakes offer dependability that is greatly needed when riding off road. The bike can be used all year round since the braking system is able to handle different terrain and weather conditions. The braking system does not cause wearing out of the rim or overheating because the disk prevents direct contact. This is where all the magic happens. The pedals create the motion which makes the bike to move. The pedals are attached to a chain which transfers the motion to the wheels creating movement. It is important to have the right type of pedals in order to keep the motion going and to avoid straining during biking. This affordable mountain bike is fitted with Wellgo Alloy pedals. The pedals are designed to assist the rider to use less effort while biking. The metal studs offer a better grip even when the pedals are wet, muddy or slippery. 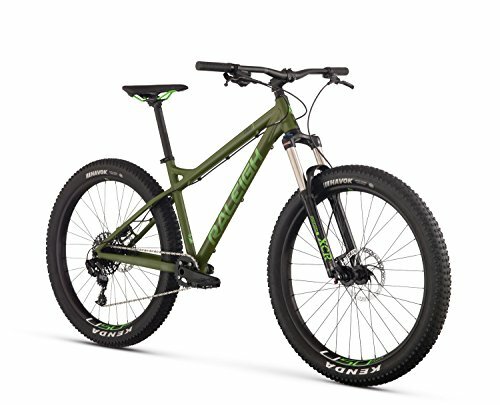 This bike has 27.5-inch rims supporting Kenda havoc 27.5*2.8 inch tires. This wheels give the bike better traction and adjust easily to the terrain being covered. This smaller wheel means lighter parts, affording the rider manageability and maneuverability of the bike in whatever terrain they are covering. This wheels can run at low pressure while carrying heavy loads. The low pressure makes it easy to move over bumps smoothly. The wider tire makes taking a corner easier due to the fact that it does not slide. The bike offers better traction due to the Tyre threads and the width of the tire hence stability when biking. The wheels increase stability in rough terrain yet maintaining greater speed and control of the Raleigh bike. The disc brakes are pretty much safe from outside interference since the fluid is housed in its own chamber. Either way, there may be air pockets which may find their way into the fluid. In that case, take your mountain bike to a professional who is equipped to open up the bike and bleed the line or replace the fluid all together. Avoid scraping the metal of the fork. Introduction of rust causes parts to lose the ease of movement leading to steering problems. Replace any parts that are broken or dented. Replace worn out tires because they lose traction and may cause accidents. Regularly service your bike so as to continue enjoying its functionality for longer. Mountain bikes have come a long way in terms of improvements. The brakes have been improved from rim brakes which caused wearing of the rim to the hydraulic disc brakes that are more powerful and less damaging. The fork has been shortened to 27.5 inches which can afford the rider more stability and balance during their ride. The Raleigh Tokul 3 has been built to handle rough terrain just as it does on paved roads. The features included are able to afford the rider safety, functionality, manageability and enjoyment throughout their riding. Aside from the parts that wear out, the bike is generally durable if it is well taken care of. Always remember to stay safe. Have your helmet at all times and remember your visibility patches especially on busy roads.